CONSIDER THE HOMELESS! in its first inception, was named Homeless Lives Matter Berkeley It was the embodiment of a vision - an idea born into reality by our initial pair of visionaries, Barbara Brust and Ingrid Powell. After working alone for a couple of weeks, cooking and bringing soup and supplies to her homeless neighbors, Barbara ran into her friend Ingrid and shared what she was doing. Ingrid immediately asked if she could ride along with her, and on their first trip together, the idea of forming a new organization arose. Both Ingrid and Barbara agreed, that looking for those living on the streets, and offering them hot homemade soup, was a different way to approach those dealing with the stress of a homeless life. Delivering it to them in their makeshift camps, or while they remained tucked in their blankets and sleeping bags, was a way to reach out with love and respect, and perhaps warm their hearts as well as their bellies. Barbara and Ingrid both hoped that this act could gain the trust of the homeless, and perhaps, eventually, allow them to hear some of their stories. Their vision was to establish relationships based on trust with their brothers and sisters on the streets where they could learn more of what they wanted or how they needed help. The idea of being able to help the homeless on their path to a better life and accompany them through the incredible maze created by the "system" would result in a more expedited success in reaching their goals. All done one-to-one, hand-in-hand. When Ingrid rode with Barbara for the first time, she decided that she too wanted to do something to help our homeless sisters and brothers, instead of just thinking about it. She was sold on Barbara's vision – all she had to do was to put herself in the place of those sleeping on the streets – and she wondered if anyone would have cared about her. Barbara immediately reached out to their housed Berkeley neighbors for help with this dream and they were both heartened by a small handful of volunteers signing on. Sadly, Ingrid was not able to spend much time actively working on this new project and made the painful decision to leave the fold. She had entered Culinary School full time and the load was too great to do both successfully. Though the transition to being without her was a bit shaky, one of those already donating her time stepped up to the plate and became Barbara’s "right-hand woman" that was so desperately needed for this group to grow. Gratitude and a BIG SHOUT OUT to Ingrid Powell for her encouragement and support in those first few weeks, as well as to Sonia Jacques for finding the time, passion and drive to continue this dream with Barbara. Without Ingrid, CTH may never have started, without Sonia, it might never have continued! And without our volunteers Consider The Homeless! could not survive!!! There is now a core group of about 30+ regular volunteers to assist with soup making and serving as well as finding and donating supplies, and more… and so Consider The Homeless! continues to grow. 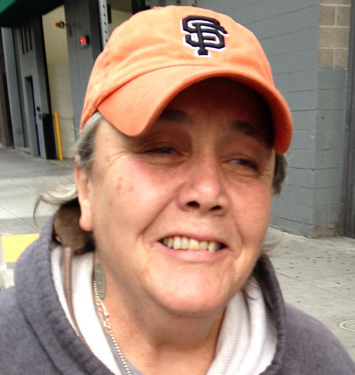 Barbara Brust has lived and worked in Berkeley for over 25 years and she has always tried to treat her sisters and brothers on the street with compassion and respect. Barbara’s small graphic design business, Lucille Design, was hit very hard by the recession in 2008 and she became perilously close to losing her home. As she struggled over several years to re-establish herself she gave deep thought to what it means to be homeless – the fear, the feelings of rejection and hopelessness. Barbara learned how to seek and accept help graciously. Now she wants to give back to her community. This profound experience of almost losing her home and landing up on the streets has informed the philosophy behind CONSIDER THE HOMELESS! – everyone deserves respect and everyone deserves a kind word and helping hand when they are down on their luck. 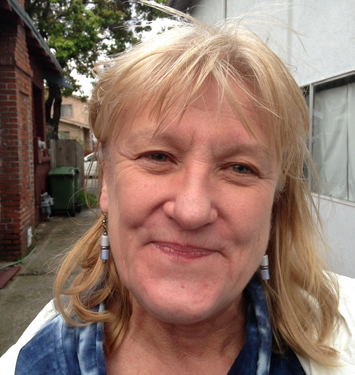 Sonia Jacques has lived in the East Bay since 1984. When she first arrived here from England, via Wisconsin, she was shocked and saddened by the number of homeless people she saw on the streets of San Francisco and other Bay Area cities. She could never understand how the richest nation in the world could allow so many people to live in squalor and poverty on the streets. While working she donated to local food banks and similar organizations and when she retired in 2014 she knew that she wanted to do something that had a direct impact on improving the lives of people in her community. Sonia saw a post from Barbara on NextDoor asking for help with her new organization Homeless Lives Matter Berkeley. She made contact with Barbara and offered her help and the rest as they say "is history".